Owner's Down Shot Sinkers are small and light weight. These bell-shaped sinkers are just right for the use with the down shot system. 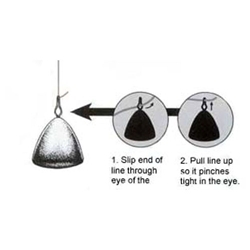 The unique eye "pinches" on the end of the line making the sinker quick to rig and should you hang up on the bottom, the eye allows you to pull back and quick-release from the snagged sinker with ease.